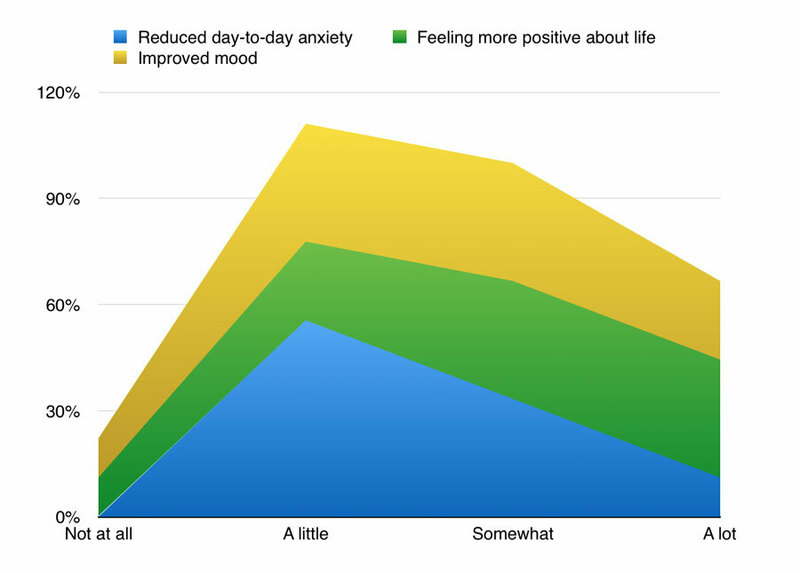 We asked people to challenge their anxiety using positive lifestyle changes for 30 days. But did it actually help anybody? Today, we can reveal the results. Want to skip straight to the results summary? Scroll down to see our infographic. I was nervous when we launched the challenge. Asking people to commit to a month of challenging their anxiety is a big thing. They were putting their trust in me and my ability to make them feel better. However, I wasn't doing this based on my personal whims. The programme was based on the material from Do More, Worry Less, our textbook on healthy living. It brings together research from around the world, so I knew the science was sound. But could we translate that into results? In short: very encouraging. People said the challenge helped them and the scientifically-backed assessment scale supported that view, too. Let's break it down into more detail. What was the 30-Day Challenge? If you are not familiar with the challenge, I will give you a brief overview here. We invited people to sign up for a free month of coaching. Each day throughout April, we sent them a video of me giving them a challenge. These looked at a variety of topics regarding good mental health including exercise, diet, sleep, relaxation, being kind to yourself and building relationships. We had a private community on social media that allowed people to share their stories and offer each other encouragement. While you have missed the live challenge, you can still enrol for the "replay". This will give you a similar experience: we'll send you a video every day with a challenge in. However, it won't be quite the same as doing it at the same time as everyone else. Click here to register for the challenge. Did people like the idea? People loved it. Typical click through rates for posts on Facebook is less than 1%1. We finished our campaign with just over 3%. Not everyone who signed up started the challenge, though. To make sure we're not sending emails to people who do not want them, you have to click a confirmation link. 49% of people did this. That means 51% did not, which is higher than you would typically expect2. It could be that people were fired up when they signed up, but by the time it came to confirming they wanted to do the challenge, they had got cold feet. Or it could be that people never saw the original email, which anecdotally seemed to be the case when I spoke to a few people. Of the people who started the challenge, 85% continued with us to the end, while 15% decided to stop half way through. The majority of these people dropped out in the first week. We use the PHQ-9 scale to measure people's mood. The "Patient Health Questionnaire" is the industry-standard measurement for people's mood. It has a series of nine questions that you can answer on a four-point scale. You can complete it online in our assessment centre. Each question asks "How often have you been bothered by feeling down, depressed or hopeless?" and you can answer "not at all", "several days", "more than half the days" or "nearly every day". Each answer as a score from 0-3. Lower scores indicate you have a better mood. A total score of 0 would indicate you have answered "not at all" to every question. A score of 27 would indicate you have answered "nearly every day" to every question. We weren't sure which way these scores would go. When you start therapy, for example, it is common for your score to go up. This is because when you focus on your anxiety, it tends to make you more agitated. However, as the weeks go on, your score should come down. We were working in a 30-day window, which is quite a short time period. So, to see reductions in such a window would definitely be a positive. What did the PHQ-9 tell us? At the start of the challenge, we saw an average score of 11.25. As a rule of thumb, if you score 10 or more you are suffering from depression, scoring 20 or more indicates severe depression. Therefore, a score of 11.25 suggests mood low enough to be classed as mild depression. 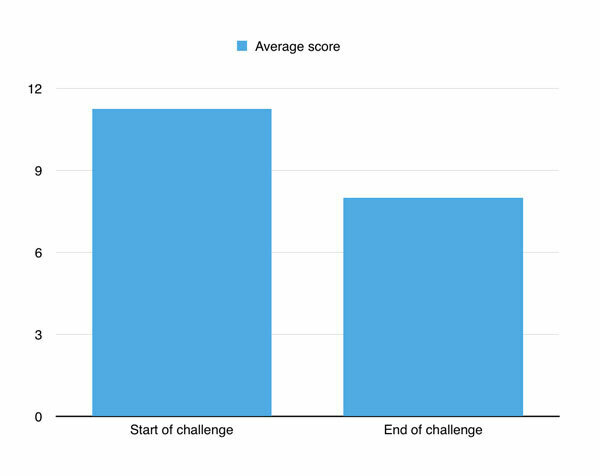 At the end of the challenge, we saw the average score drop to 8. This is a 3.25 point decrease or a 12% improvement. A score of 8 suggests that your mood is within typical levels. This is really positive: we want the score to go down. I want to make it clear that I am not saying "people were depressed, then they did our challenge, and now they're not." The data sample is too small, and the PHQ-9, while very accurate, is not a replacement for a doctor's diagnosis. However, people's mood did, on average, improve in a meaningful and significant way. Not everyone experienced this mood lift. Some people found the programme anxiety-provoking to a degree where it had the opposite effect: 14% of people. However, 86% of people did see this effect. How did people feel about it? PHQ-9 is a brilliant tool because it gives us an objective measurement. However, we were also interested in how people felt about the challenge. So we asked them. We also asked whether they thought the challenge had helped them. 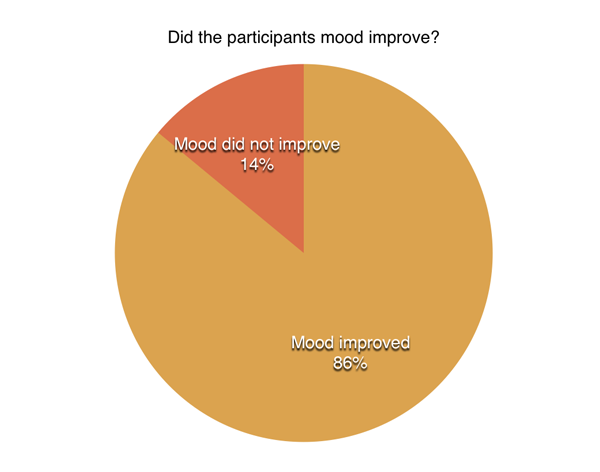 86% of people thought it had improved their mood and left them feeling more positive about life and 100% of people said it had reduced their day to day anxiety. So when we say 100% of people felt it had reduced their anxiety, it isn't a binary on/off statement. It is remarkable, though: in just 30-days it not only reduced people's worrying but some felt that it had reduced their worrying "a lot". We are considering running the challenge against next year, and that question was a wipe out: 100% of people said they would be interested in taking part again. What did people say about it? As well as the anonymous feedback gathered from the survey, I also asked people if they would be willing to talk about how they found the challenge. Here are some of the comments. I looked forward to finding out what you were going to challenge us to every day. I loved the variety of the challenges. Every time I did one I felt so good about myself. I loved being involved in the group, makes you feel like your not the only one with anxiety and the positive feedback. Like I had my very own set of cheerleaders. It felt like a support network on Facebook when you realise you're not the only person suffering. While all of this has been very positive, I want to be totally transparent and talk about some of the reasons why we cannot say this data is 100% accurate. First, only a few hundred people started the challenge. That's not a huge sample size, and many of them did not complete the mood assessments and feedback forms fully, so we were unable to include them in the data. Second, there was no control group (a group of people who were on the waiting list to do the challenge next month, for example) that we could compare against to check the challenge was definitely the thing that was causing their increase in mood. It probably was, but you need a control to be completely certain. It turns out that you can reduce your anxiety and increase your mood in just 30 days. And you can do it with changes to your lifestyle that make it more mental health-friendly. I knew the science was sound: I've trawled through countless peer-reviewed journal articles to dig it all up. However, translating the science lab into the real world can sometimes be difficult. In this case, though, it has worked. Well, if you're not already a member of our community, you should sign up using the form below. We'll send you regular advice on improving your mental health and as you can see, it works. If you haven't taken part in the 30-day challenge, you can also sign-up for the replay. Published 22 May 2017. Written by Chris Worfolk. Subscribe to our newsletter to get more great content emailed to you directly. Plus, we'll send you some chapters from our books for free. We never share your details and you can unsubscribe at any time. Mark Irvine. Facebook Ad Benchmarks for Your Industry. Word Stream. 28 March 2017. Link. Pam Neely. New Research in the Epic Battle Between Double and Single Opt-in. GetResponse. Link.